Earlier this summer, Flat Tire Décor sent me two of their unique containers. I’m a sucker for plant pots anyway, and these are extra cool. 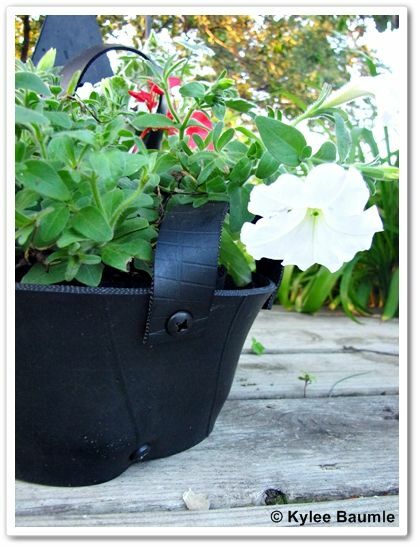 They’re made from used automobile tires! The way they’ve cut the tires and put them together is attractive and no two are exactly alike, because of the way they're made. I decided to pot them up using some summer annuals. 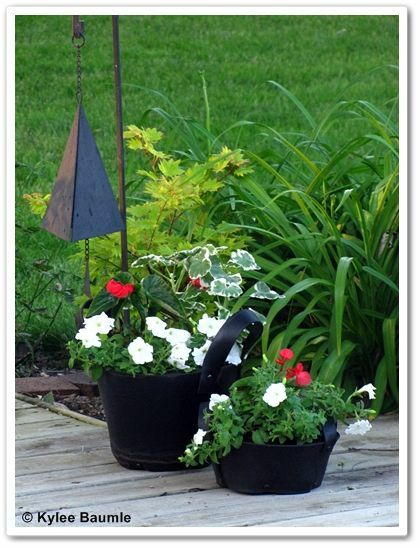 I used the same plants in each one, except that the smaller one is minus the Pelargonium. When winter comes, I’ll be bringing the containers into the house and using them in other ways. I might use the smaller one to hold our remotes. On their website, they show using one for putting beverages on ice. 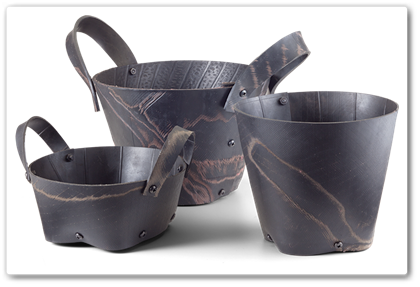 (They aren’t watertight though, so if you’re using them inside, you’ll want to allow for that.) The ways for using these is endless! I like that they’re using a recycled material to make their product and that they’re being made in the US (Wisconsin). 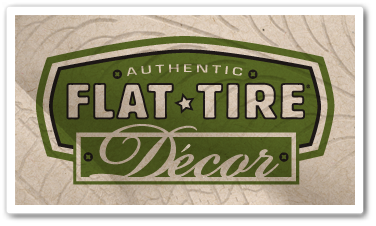 For more information about Flat Tire Décor, visit their website or you can find them on Facebook and follow them on Twitter @flattiredecor. This product was sent to me free of charge. The opinions expressed about the product are my own. If I like it, I will say so. If I don't, I'll say that too. 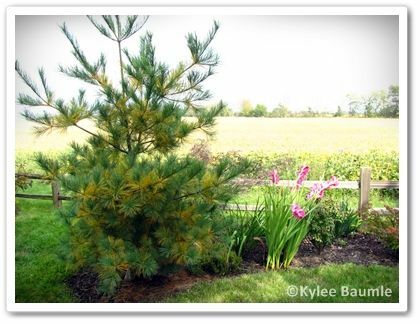 A few years ago, we lost a white pine tree. It seemed like one day it was fine and the next it was dead. Of course things seldom happen that way, and we really don't know what happened with this particular white pine. But we cut most of it down and used it as a directional and pedestal for a bird house in the garden. After that, we watched our other pines more closely. In the fall, we noticed that they had yellowing of some of the needles, which then fell off. Of course, we feared the worst - that we were going to lose yet another pine tree or two. It turns out that our fears were unfounded in this instance. It's perfectly normal for white pine trees to do this. In the fall, they shed older needles. Have you ever walked through the woods where pine trees grow? On the forest floor are plenty of needles that were shed from those pine trees, creating a nice mulch for winter. Speaking of using pine needles for mulch, I use them around my azaleas, blueberries, hydrangeas, and lingonberries. Pine needles add acid to the soil as they break down and these plants like that. 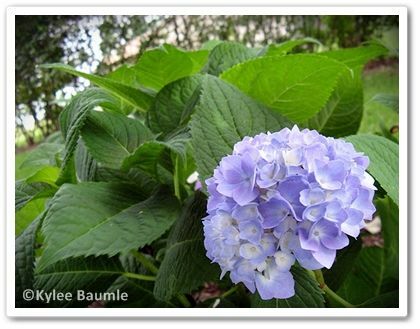 In fact, one year, I conducted an experiment with the hydrangeas to see if I could get them to bloom blue. 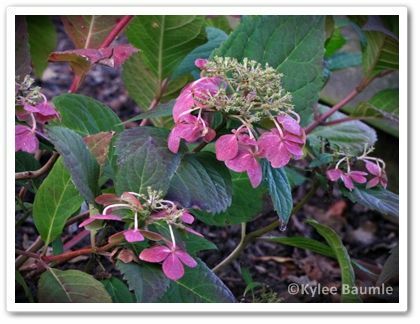 Hydrangeas depend on the pH of the soil to determine the color of their bloom. 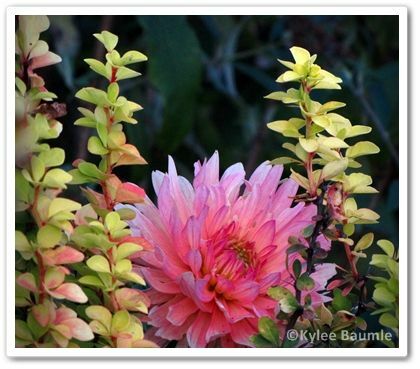 If you have alkaline soil (we do), they'll bloom pink. Acidic, and they'll bloom blue. 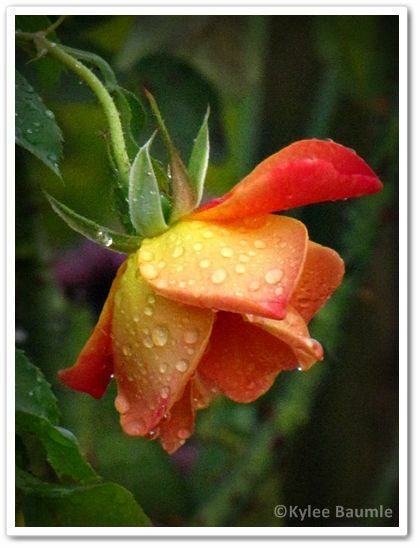 Of course it depends a bit on the species and cultivar too, but this is a general rule. I mulched with pine needles one winter and don't you know, the first blooms of the year had a bluish tint to them! 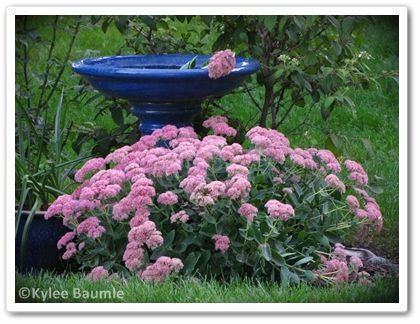 As the summer progressed, subsequent blooms became more and more pink. 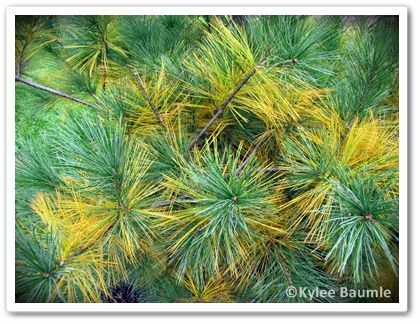 Had I continued to add fresh pine needles all summer, I'm sure they would have continued to bloom with that bluish tint. 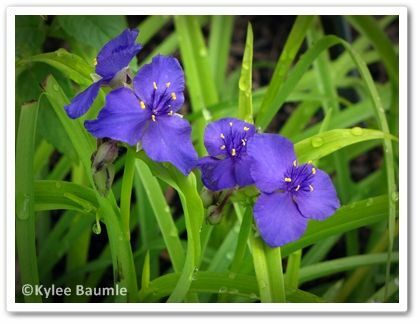 There's a sweet little rock garden plant, native to the Pacific Northwest, that caught my fancy several years ago. I first saw Lewisia (Common names: Cliff Maids, Bitterroot) on the Spring Hill website and I knew I had to have it. 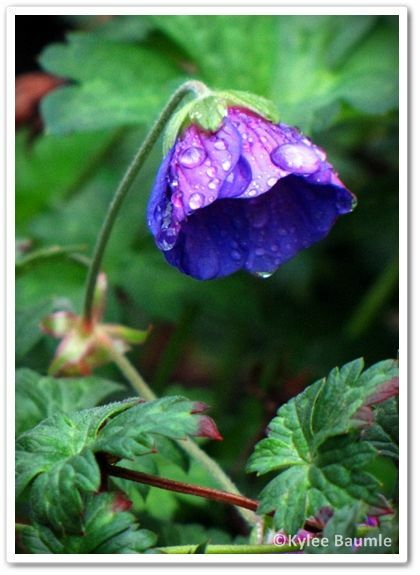 'Little Plum' came to live in my garden, but it didn't live very long. This was early in my gardening days, before I learned about growing zones. It was before I learned about clay soil vs. sandy soil. Before I learned about good drainage. It only takes a few garden losses before you are motivated to do some research to try and figure out why a plant didn't thrive in your garden. 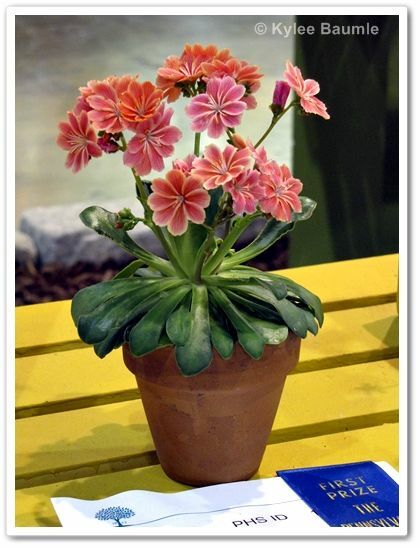 Lewisia is a succulent type of plant for zones 4-8 (mostly, depending on species) that likes average to poor soil and excellent drainage. 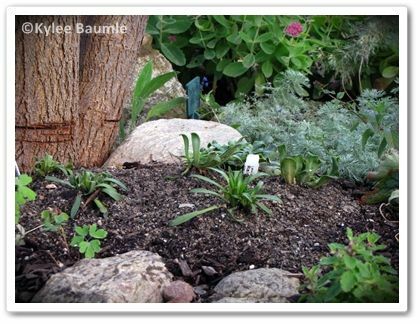 The crown of the plant is subject to rotting, so using a pebble or sand mulch helps keep moisture away. 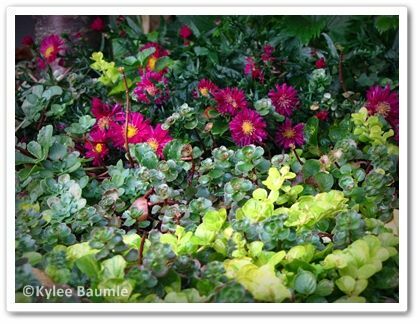 It's a great rock garden plant, which is where I now have mine growing. 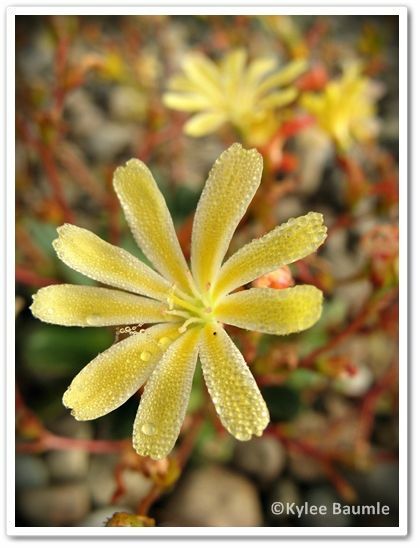 Yes, I tried again, once I learned what lewisias need to grow well. I got a few new lewisias last week at a plant sale (Lewisia cotyledon 'Rainbow Mix' and Lewisia longipetala 'Little Peach'). I planted them in a mix of sand and compost and elevated the planting area. I used pure sand around the crown of the plants. They'll get sun most of the day, although they prefer some afternoon shade. I think this will be fine in my northern garden. Philadelphia Flower Show this spring. The L. cotyledon is only hardy to zone 6, so we'll see how it does in my zone 5b garden. I've successfully grown several zone 6 plants over the years, but Lewisia can be somewhat difficult in the best of circumstances. Lewisia in my 2008 garden. 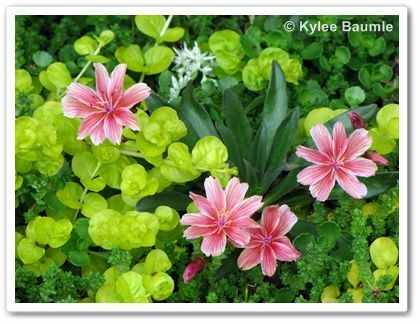 Like most rock garden plants, lewisias aren't large. At maturity, they're less than six inches tall and 6-9 inches wide. I've seen plants that are somewhat larger though. 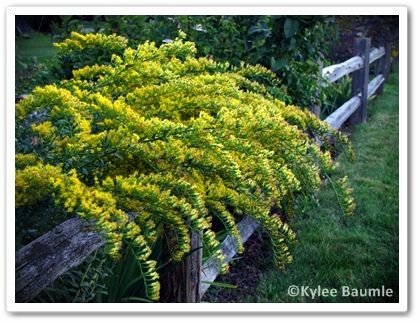 They bloom in late spring and early summer, with occasional light rebloom later in the season. 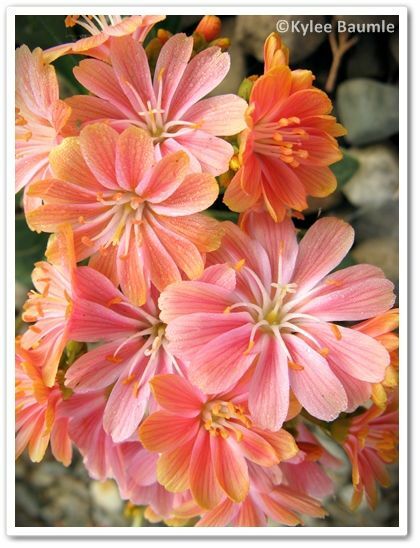 Here's a bit of trivia regarding Lewisia: They get their name from Merriwether Lewis (of Lewis & Clark), who collected them during the Lewis & Clark Expedition in the Pacific Northwest during 1804-1806. 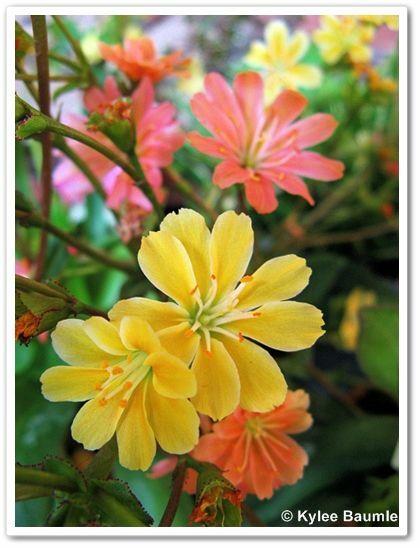 Lewisia blooming in my garden in May 2011. When things get stressful, I go to the garden. There's something calming about walking among the flowers and plants and trees and this afternoon, I needed that. Some health issues in our family are an immediate priority at the moment and while the rest of our lives needs to keep up, family comes first. So I grabbed the camera and walked out back and started shooting. 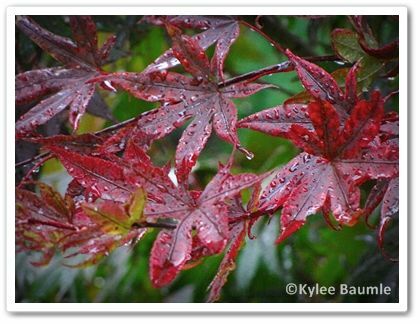 The colors of fall are some of my favorites - in the leaves and in the flowers that bloom this time of year. 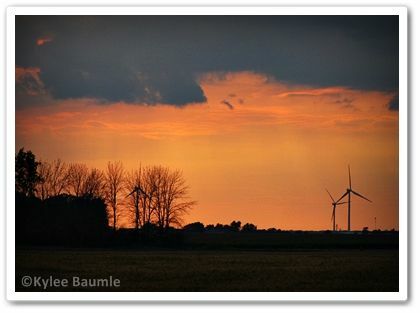 After some time of shooting this and that, my batteries were waning so I headed back to the house for some new ones. I walked past the chicken run and as usual, the chickens came over to see if I had a treat for them. No, I didn't, but they sure had one for me! I couldn't believe what I was seeing. 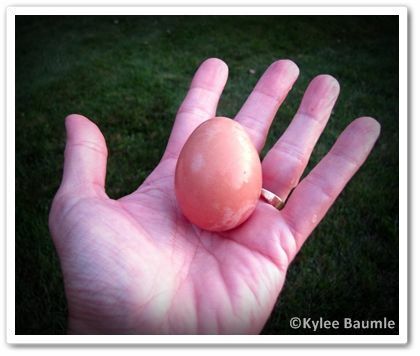 Right there, in front of God and everyone, laid an egg on the ground. I thought it was too soon. They're about 16 weeks old. The age at which a chicken will lay an egg varies according to breed, and we didn't expect any of them to lay until at least the middle of next month. 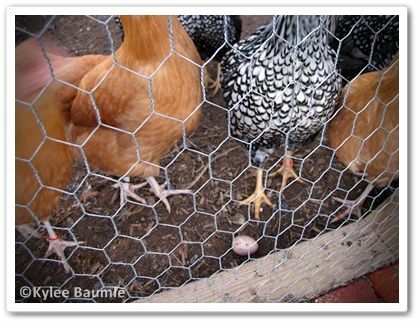 Buff Orpingtons will start laying at about five months of age and Silver Lace Wyandottes not until seven or eight months. How about that. We have a precocious chicken in the bunch. We just don't know which one it is. 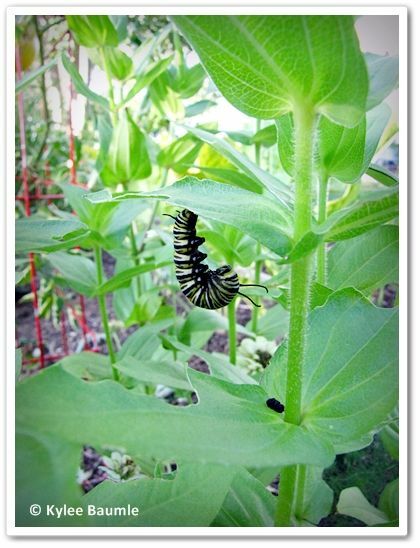 Every summer, I love to watch as the monarchs fly around, laying eggs on the milkweed and seeing the tiny caterpillars chomping their way to a size ready for the miracle of metamorphosis. Last week, I found two of them, hanging in the characteristic "J" position, one on a daylily leaf and the other on a nearby zinnia. It's exciting, watching this cycle of life. I've seen it before, in detail, even giving up sleep in order to not miss a single step. And when I get the chance to see it again, I take it. Yesterday, I noticed the chrysalides had started to turn dark, so I brought them into our house and attached them to a stick inside a punch bowl. I've actually raised monarchs this way before, from the caterpillar to adult stage, with 100% success. I had no reason to think that these two chrysalides wouldn't have adult butterflies emerging from them when the time was right. But sometimes things go wrong. Things you never expect and didn't know could happen. This morning, I noticed a thin, white thread hanging from the zinnia chrysalis. I thought nothing of it, thinking it was a cobweb or something. I pulled it away. 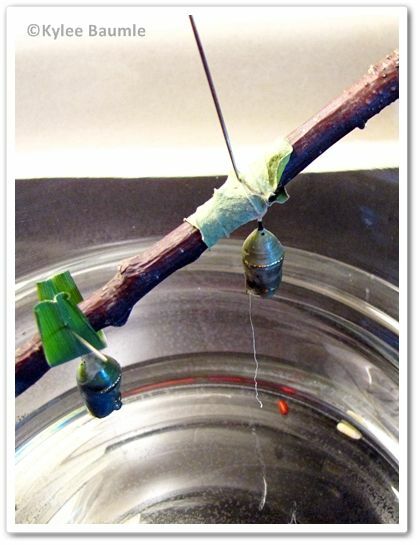 Later in the day, I noticed another white thread hanging from the same chrysalis. Only something alive could be doing this, but I didn't see anything. I went to the internet to research. 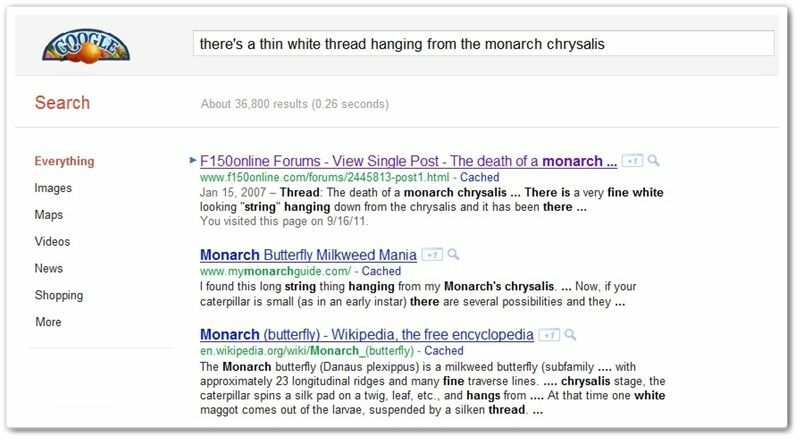 It didn't take long to find out that something was wrong and that this monarch would not be emerging alive. One of the monarch's natural predators is the tachinid fly. 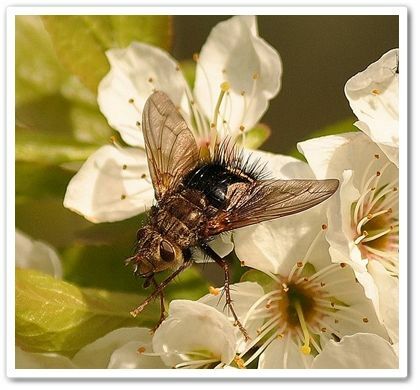 At various stages in development, the tachinid fly can lay eggs in the monarch caterpillar, or it can even lay them in the monarch when it's only a tiny egg on the leaf. The monarch continues to develop, unaware that it's been parasitized. Undisturbed, the tachinid eventually emerges from the chrysalis just as it did with ours. I found two reddish-brown pupae on the bottom of the bowl, along with one white maggot. I crushed the pupae and the maggot, once I learned what they were. It's highly unlikely that the adult butterfly will continue to develop now. the reddish brown pupa cases and the maggot in the bottom of the bowl. 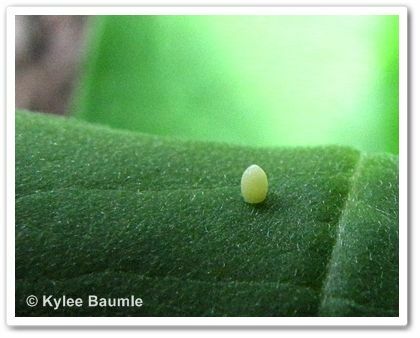 As if that didn't make me sad enough, I noticed a clear liquid coming from a spot on the daylily chrysalis. I noticed this when I brought it in, but thought it was dew or something. I fear that the same fate awaits this chrysalis, too. Nothing I did caused this. And there was nothing I could do to prevent it. It just drove home the dangers that these creatures face - dangers that make protecting their habitats even more important. The monarch populations have been dwindling over the years, due to natural disasters, predators, and mostly from disappearing habitat. The first two, we can do nothing about, but the third, we can. I do allow common milkweed to grow in my gardens to some extent. No, I don't like its appearance as a plant, and if it came up in greater quantity than it does, I would likely pull some. But when swamp milkweed (Asclepias incarnata) comes up, it stays. I purposely grow butterfly weed (Asclepias tuberosa) in both orange and yellow forms. Monarchs live and grow in my gardens and I like it that way. I know there are other chrysalides in my gardens, even though I don't know where they are. 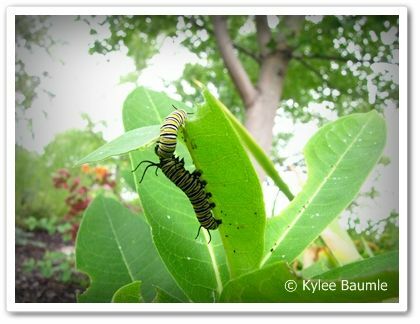 Monarch caterpillars will sometimes crawl 30 feet away from the milkweed on which they have been feeding to a protected location to form a chrysalis. I feel lucky when I find one, let alone two. But this is not a lucky day. I know it's all part of life, this death by predator stuff. But I don't like it and I'm sad. Not that I didn't get to see two monarchs as they begin their lives as butterflies, but because it's two fewer butterflies that will live to fly to Mexico and back again next spring. Two fewer butterflies to start the process all over again. Each monarch will lay approximately 500 eggs over the course of their short lives. If there are five generations of monarch in a single summer and each monarch lays 500 eggs, and each one of those lays 500 eggs (and so on), you don't really have to do much math to figure out how many monarchs there won't be because the tachinid flies decided to use the monarchs to carry on their own life cycle inside them. On the other hand, thank goodness they do lay so many eggs. Predators will do their thing, but many will survive and live out their days the way they were intended and we will be here to enjoy them. 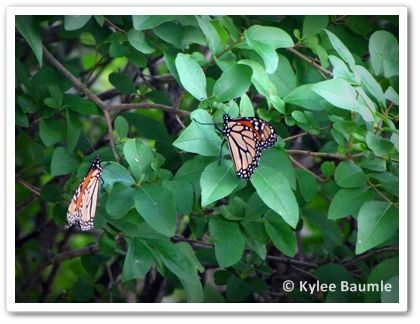 Migrating monarchs seen in our yard earlier this week. When it's a moth. 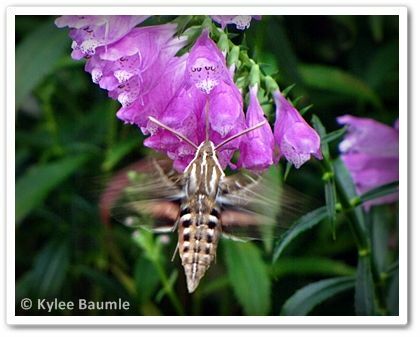 Yesterday, I had the pleasure of watching and photographing a hummingbird moth as it sipped nectar from the garden phlox and the obedient plant. I spent nearly half an hour entranced by it and it didn't seem to know I was anywhere around. 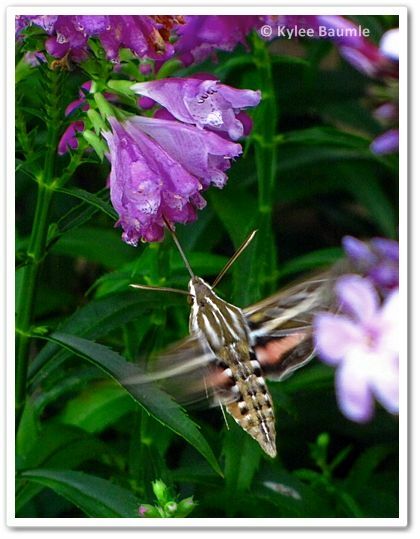 The while-lined sphinx moth (Hyles lineata) is commonly known as a hummingbird moth because of its flight habit. 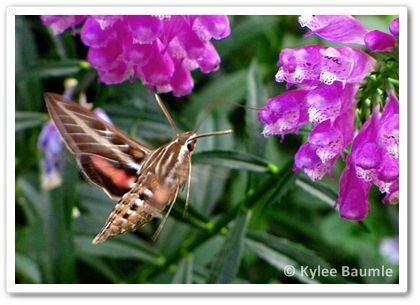 While not darting as quickly as a hummingbird, it hovers much like one and has the same feeding mannerisms, except that the moth uses its proboscis instead of a tongue to drink. This moth is common throughout the United States and part of Canada and Mexico during the months of April through October. In their caterpillar form, they pupate underground in a chrysalis and emerge after two to three weeks. Yesterday was a gorgeous day and the pollinators were busy, busy, busy! One little patch of Verbena bonariensis had 12 buckeye butterflies on it at once! The buckeyes are all over the place in the yard and garden this time of the year. 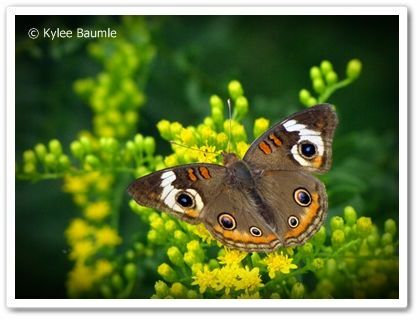 It's one of my very favorite butterflies because of its eye spots. There were many, many monarchs flying around last evening, too. It's peak migration season here and we lie along a major corridor as they make their way to their winter home in Mexico. It wouldn't surprise me if they spent the night clustered in a nearby tree before continuing on their way this morning. 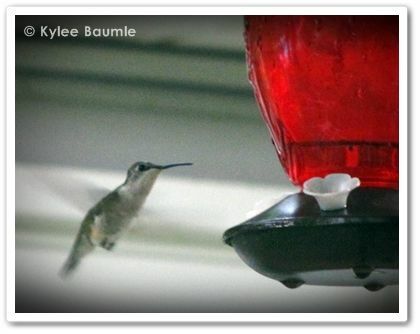 Hummingbirds are still feeding heavily, as they too prepare for their long trip south for the winter. I love this time of year as we get to see these winged wonders at their best!